These are no ordinary chocolate cupcakes! 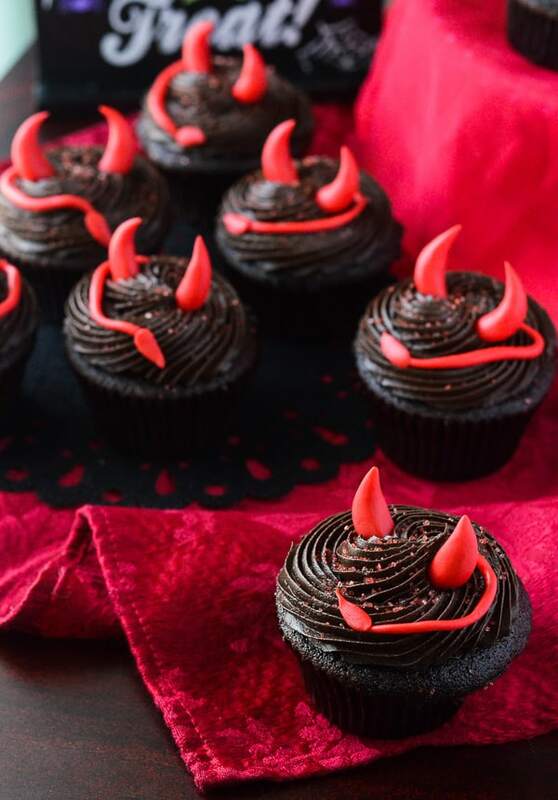 These Spicy Little Devil’s Food Cupcakes turn up the heat with a cinnamon & cayenne ganache filling, and are topped with devilish decor perfect for any Halloween party! I’m taking ya’ll back to my roots this Halloween. Get a load of these cute, devilish little guys! They’re such dapper treats, aren’t they? So enticing with their adorable little red horns and tiny tails. 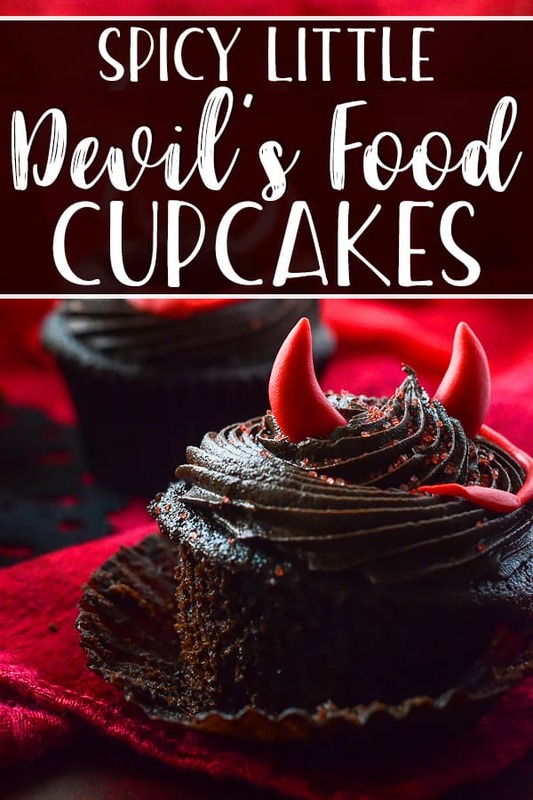 JUST TAKE ME TO THE DEVIL’S FOOD CUPCAKES ALREADY! I either need more friends, or smaller recipes. 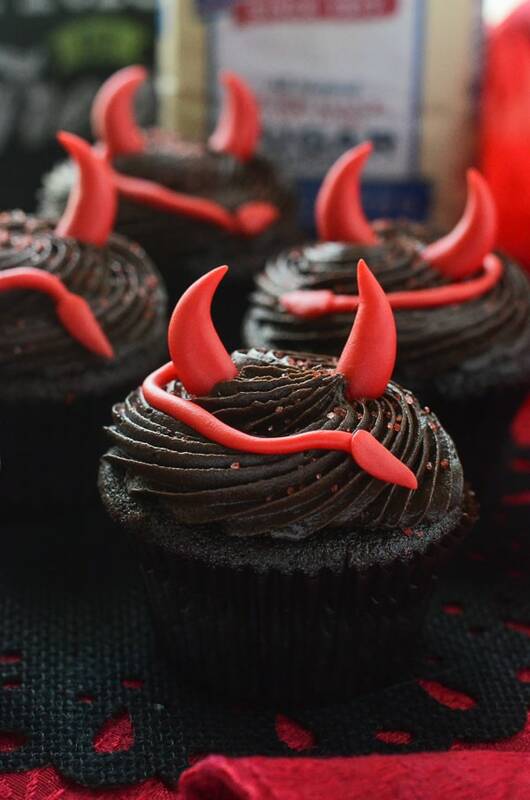 These handsome little devilcakes might just disappear totally, though. Just in case the name didn’t give away the secret ingredients of these cupcakes, let me elaborate. If you have, you’ll know that it’s got just a touch of heat to it, supplied by the cinnamon and pepper hidden inside the chocolate itself. 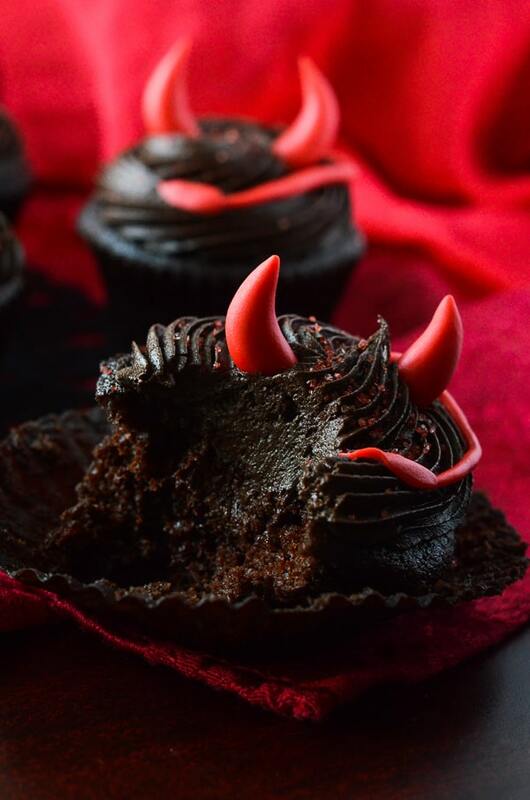 These cupcakes are a moist & luscious dark chocolate devil’s food, topped with a deceptively decadent chocolate fudge – with a surprising spicy cayenne-chocolate ganache filling. This isn’t like eating jalapenos or anything, so don’t be afraid if you’re not big into heat. It adds a really nice warmth as you eat the cupcake – a sensation you wouldn’t necessarily expect from a cupcake, but once you experience it, you might want a repeat performance. Hopefully, if you’re reading this, you’re a big chocolate fan – because these tasty little guys are a powerhouse of chocolate. From the cake to the ganache to the icing, there’s no shortage of chocolate layers waiting to calm your cravings. 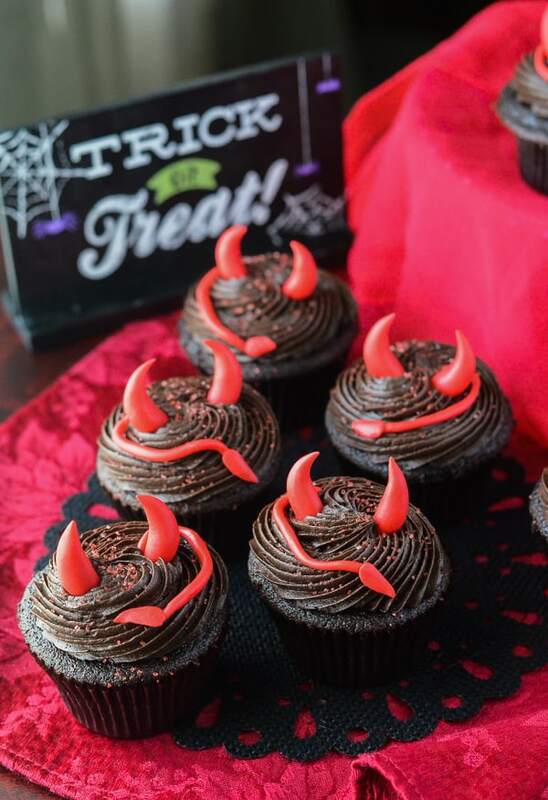 Leave the Halloween candy for the kids, and whip up a batch of these cupcakes for your friends. Or just for yourself. Who says you can’t Trick or Treat solo? Looking for more fun Halloween recipes? 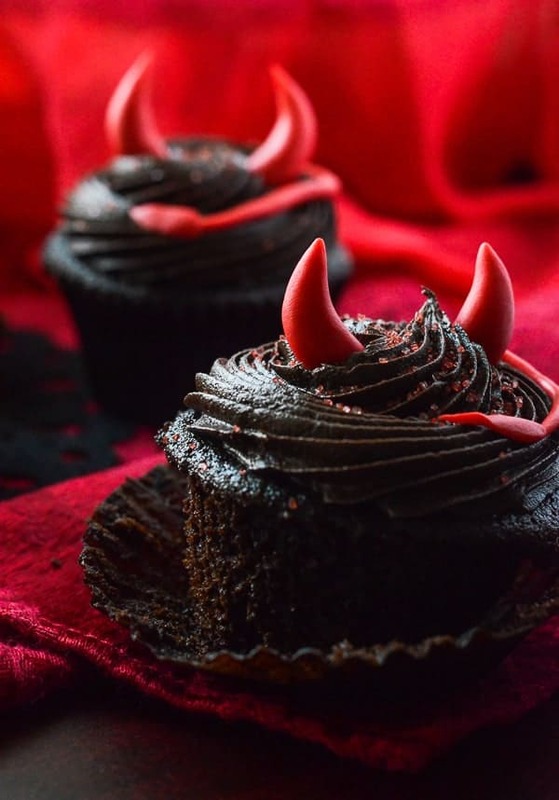 PIN THESE DEVIL’S FOOD CUPCAKE FOR LATER! These are no ordinary chocolate cupcakes! 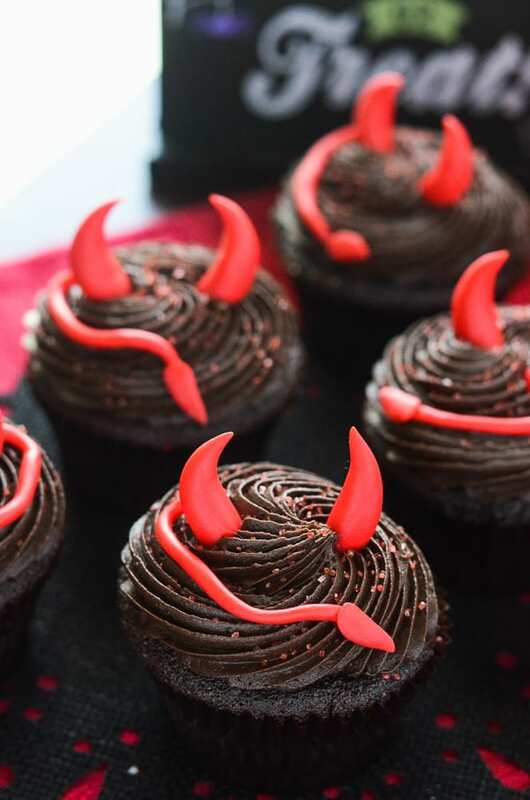 These Spicy Little Devil's Food Cupcakes turn up the heat with a cinnamon & cayenne ganache filling, and are topped with devilish decor perfect for any Halloween party! In a stand mixer fitted with a paddle attachment, cream butter, sugars, and vanilla on medium-high speed 2-3 minutes, until light in color and fluffy. Lower speed to medium and add eggs one at a time, being sure to blend fully before adding the next one. Combine buttermilk and coffee in a measuring cup. Alternate adding the flour mixture and buttermilk-coffee blend, beginning and ending with flour, in ⅓-1/2 cup intervals, mixing until just incorporated between additions. Scrape bowl and paddle as necessary. Divide the batter evenly between cupcake liners, filling each only ⅔ of the way. Bake for 17-20 minutes, until a toothpick inserted in the centers comes out clean. Remove cupcakes from oven and allow to cool in the pans for about 5 minutes before removing to cooling racks. Place the chopped chocolate in a medium bowl. Place the cream in a microwave-safe cup and heat in 30-second intervals for 1½-2 minutes until cream is hot. Pour cream over chopped chocolate and allow to sit, undisturbed, for 5 minutes. Whisk the cream and chocolate together from the center of the bowl in small circular motions until fully combined. Add butter, cinnamon, cayenne, and vanilla, and whisk until fully blended. Allow to cool at least one hour before filling cupcakes. When ready to fill, cut a ¾-1 inch hold in the center of each cupcake about halfway down. Spoon ganache into a zipper or pastry bag and fill cupcakes until ganache just peeks over the top. Sift cocoa powder and sugar together in the clean bowl of a stand mixer fitted with a whisk attachment. Mix on medium to combine powders, then add butter and vanilla. Whip until incorporated, then increase speed to high for 4-5 minutes until icing has increased in volume and is lightened a bit. Add whipping cream and salt on low speed until incorporated, then whip on high for another 2-3 minutes until fluffy. Spoon icing into pastry bag fitted with your favorite cupcake tip and swirl away! To garnish the cupcakes with the horns and tails, I used white fondant that I dyed red, and shaped tiny pieces into the shapes I needed. I also sprinkled them all with a little red sugar. 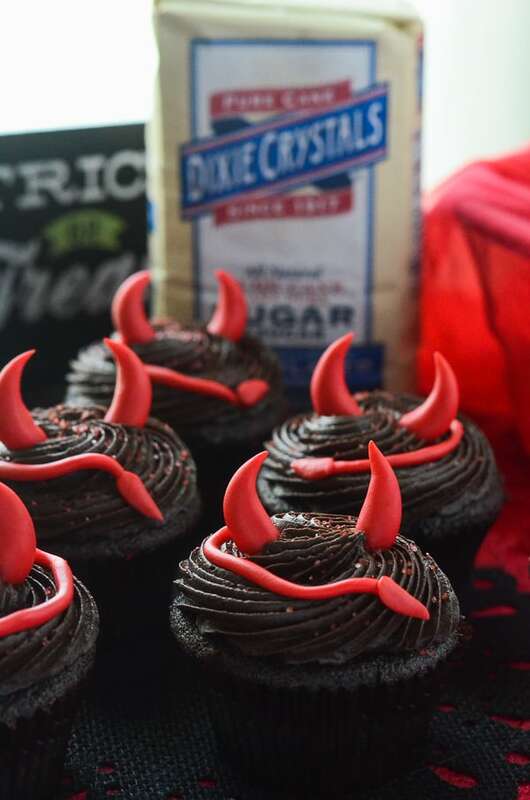 Check out these 19 other amazing fun & spooky Halloween treats, brought to you by #SundaySupper and Dixie Crystals! Dixie Crystals has been around a long time, and they have plenty of tasty recipes on their website, whether you’re looking for a Halloween treat or just an after school snack! Be sure to follow them on Facebook, Twitter, Instagram & Google+ for any of your baking needs! And if you need even more Halloween inspiration, check out their Pinterest board, as well as Sunday Supper’s Halloween Treats and Sweets with Dixie Crystals! 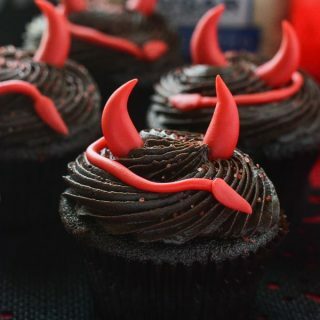 These little devils are too cute, and Oh my that spicy cayenne-chocolate ganache filling sounds wonderfully devilish! Chocolate with a spicy kick – I’m all over it! And they are perfectly decorated too. I mean, sweet and spicy is a fantastic combination, and how could this cupcake not be insanely delicious?! I cannot wait to try these! Want… chocolate… now!!! That’s what your photos made me say!